ill Barnet American Artist: b. 1911-2012. 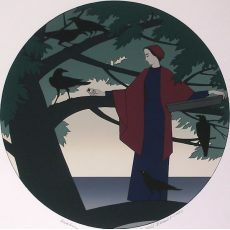 Will Barnet was born in Beverly, Massachusetts. He studied at the Boston Museum of Fine Arts School and then at the Art Students League in New York. He cites Daumier as his first great inspiration at the age of 14, both for "his profound vision of life and his unequalled draftsmanship." 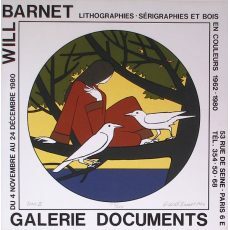 A prolific graphic artist, Barnet changed his style significantly at different points in his career. His earliest works were influenced by expressionism. His work of the 1930s and 1940s deals with the social themes in the forefront of the depression era, but also the more personal theme of the mother and child. They were followed by abstract works in the 1950s and 1960s, and finally evolved into more figurative works of silhouetted forms set against geometrically designed backgrounds. From the earliest years Barnet valued concept equally with technique. Printmaking gave him a wider, freer means of expression although painting has remained another important medium throughout his career. He later taught art at such leading American schools as Yale University, Cornell University, the Art Students League and at Cooper Union. Among his students at Cooper Union were Mark Rothko and Cy Twombly. 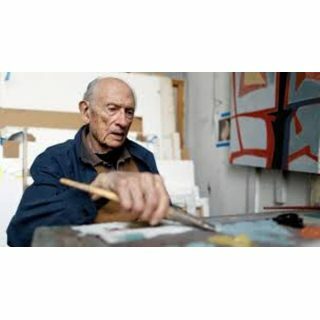 Barnett's work has been exhibited in prominent museums and galleries in the United States and Canada and is included in many prestigious collections, including the Metropolitan Museum of Art, the Guggenheim Museum in New York and the Boston Museum of Fine Arts.